Home Local News SHOCKING! Julia Barretto explains why she rejected LP’s P5M offer to campaign for Roxas! SHOCKING! Julia Barretto explains why she rejected LP’s P5M offer to campaign for Roxas! 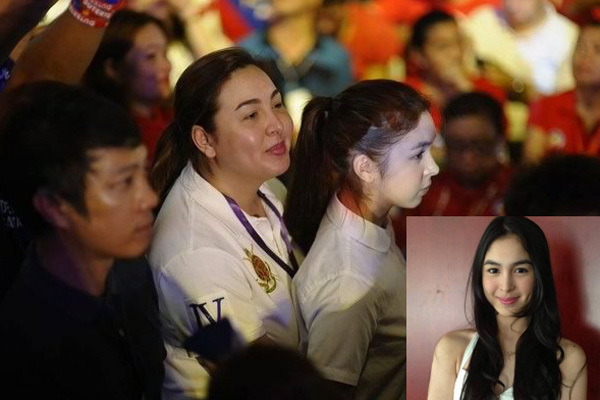 After more than one year of silence following President Rodrigo Duterte’s victory, young, beautiful, and down-to-earth actress Julia Barretto, broke her silence and explained why she declined the P5M offer by the Liberal Party to promote its candidates, especially former DILG Secretary and Presidential candidate Mar Roxas. As we remember, Julia was allegedly offered P5M by the LP party, but the actress rejected the offer, and in return, she voluntarily supported President Duterte without any cost. On Friday, Pinoy Pride showbiz correspondent Pia Ursula was able have a 20-minute one-on-one interview with Barretto. The actress in the past dodged many times when asked about the controversial issue, but she finally explained why she declined the offer. The following is part of Ms. Barretto and Ms. Ursula’s conversation. Pia: Was it true that LP did really offered you P5M but you rejected? Julia: Yes, it was. Both my Mom and my manager were contacted by someone from the party around a month before the May 2016 Elections. Pia: What was your reaction? Julia: Mom did not told me immediately. She and my manager discussed about it a couple of times without my knowledge. My manager was hesitant because she was also a big Duterte supporter so she lefty the final decision to my Mom. Mom decided to let it go without telling me. Pia: So in short, they rejected the offer without consulting you? Julia: Not exactly like that. They decided to say no but they did not tell the LP with their decision first before asking me. Mom asked me if I want to promote them, but she also told me that she and my manager were out. They asked me if I want P5M to promote Secretary Mar, but after weighing things, I also said no. Pia: What made you decide to say no? Is it because your Mom and manager said no as well? Julia: It was my first time to vote. I was so excited and I was so mad at Mayor Duterte. It was against my will and conscience to promote someone else while my heart was supporting another candidate. My conscience wouldn’t let me do it. Pia: P5M is not a small amount of money. Do you have any regret on not having that money? Julia: Yes, it was a large amount of money. Medyo nanghinayang din nong una, but naisip ko na lang, I am young and I can earn ten folds of that amount sooner. What important was, I am true to myself. Pia: Do you have any regret supporting president Duterte? Julia: No, not at all. I supported him and I am always be his supporter. I am a simple person who have nothing to be afraid of. I’m not drug addict or terrorist or activist militant so I have peace of mind. Barretto also said that after the May Elections, she was blessed a number of modelling and acting projects which made her showbiz career busy. Julia, a beautiful young actress from the well-known Barretto beauty clan, continues to do well under the radar.